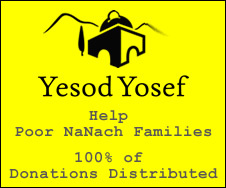 FUND TO REPATRIATE THE HOLY REMAINS OF RABBI NACHMAN FOR BURIAL ON MT. ZION-JERUSALEM. Under the auspices of the World Federation, we have prepared an account for donations dedicated to the implementing of the above operation. Donate and receive a tax deduction for your contribution. Did you know that the command and oath to take Josef's bones out of Egypt came before Josef died? Did you know that the oath to give 10% on condition that we had cloths to wear and bread to eat came before Jacob even met his zivoug? Saying Na Nach (please rest in peace Nachman) takes on more importance when you keep the promise from before the promise. You have cloths to wear, you have bread to eat? Then you need to tith! The best tith is the tith which is dedicated to fulfilling pakod pakodeti!! !